Trabajo remitido como prestación por la beca FEIOMM recibida para asistir al 37º Congreso de la ASBMR (Seattle, 2015). Aromatase inhibitors (AI) are effective adjuvant endocrine therapies for breast cancer patients, although they have been associated with an increased risk of osteoporotic fracture. Trabecular Bone Score (TBS) loss has been previously demonstrated, although it may vary among AI-treated patients. This study aims to identify the genetic basis associated with TBS change by studying steroidogenic pathway genes. The B-ABLE cohort studies prospectively postmenopausal women with breast cancer under treatment with AI. TBS is calculated from the raw data acquired in dual-energy x-ray absorptiometry (DXA) scan at the outset of the study and at the end of AI-treatment. The relative TBS change was calculated as the percentage variation of the TBS value at the end of treatment from baseline. 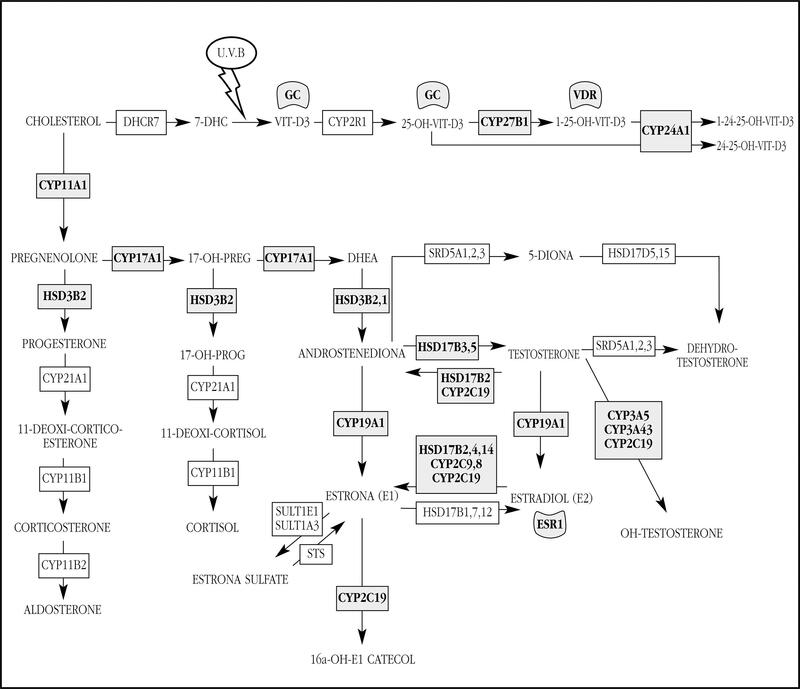 To study the possible genetic association, nucleotide polymorphisms (SNPs) were genotyped in genes CYP11A1, CYP17A1, HDE3B2, HDE17B3, CYP19A1, CYP2C19, CYP2C9, ESR1, GC, CYP27B1, VDR and CYP24A1. The possible relationship between genes and TBS changes was studied by multiple linear regression, considering models of dominant, recessive and additive genetic inheritance. The study included 212 women that had not been treated with bisphosphonates and had available TBS data. Half of the patients had been treated previously with tamoxifen. The percentage of intraindividual TBS change was -0.04% [95% CI: -0.05 to -0.03; p<0.001] at the end of AI treatment. The SNP rs6013897 in the gene CYP24A1 showed a significant association with TBS reduction [p=0.03565; coefficient β (95% CI) = -1.55 (-2.98 to -0.11)]. The CYP24A1 gene could be involved in the phenotypic variability found in bone microarchitecture deterioration during AI treatment. Aromatase inhibitors (AI) are widely regarded as effective adjuvant endocrine therapies for breast cancer patients with positive hormone receptors. These patients generally present a good prognosis, with an overall survival rate higher than 80%1,2. However, these therapies have been associated with side effects that may affect quality of life, such as bone loss and increased osteoporotic fracture3. Clinical guidelines for treating AI-related bone loss (AIBL) recommend strict control of bone mineral density (BMD) and other risk factors to assess the need for treatment with antiresorptive therapies4. The Trabecular Bone Score (TBS) has been proposed as a tool for skeletal evaluation, complementary to conventional BMD, which has proven to be clinically useful for predicting fracture risk5. The TBS is a non-invasive measure of bone microarchitecture extracted from bone densitometry by means of dual radiological absorptiometry (DXA) of the lumbar spine. Interestingly, most individuals with a fragility fracture have BMD in the osteopenic or even normal range, which indicates the importance of bone quality in fracture risk6. High TBS values indicate a better microarchitecture, while lower values reflect poor bone quality with greater susceptibility to fracture7. Regarding the treatment of breast cancer with AI, it has been shown that TBS could be affected with a significant microarchitecture reduction, comparable to BMD loss8. The B-ABLE cohort is a prospective clinical cohort of postmenopausal women with early-stage breast cancer receiving AI9 in whom an association between CYP11A1 gene polymorphisms and bone loss after 2 years of treatment with AI10 has been reported. This indicates that the AIBL variability observed among patients could be partly genetically determined. As with AIBL, a great variability in TBS changes has also been observed among patients treated with AI8, which suggests that there may also be a genetic basis in the response to AI. No genetic study has yet been conducted on TBS loss in AItreated patients, so it is not yet known if this parameter is also genetically determined. Our study aims to determine the genetic basis of this variability in the B-ABLE cohort by genotyping genetic variants in genes of the steroidogenic pathway. From December 2005 to February 2013, postmenopausal Caucasian women diagnosed with early breast cancer, positive for hormone receptors and candidates for AI treatment (cohort B-ABLE) were consecutively recruited. The postmenopausal state was defined as patients aged >55 years with amenorrhea for more than 12 months, or those aged ≤55 years with luteinizing hormone levels >30 mIU/ml or values of follicle stimulating hormone >40 mIU/ml. We excluded women with a history of bone disease, rheumatoid arthritis, metabolic or endocrine diseases, previous diagnosis of osteomalacia or Paget, concurrent or previous treatment with bisphosphonates, oral glucocorticoids, or any other drug with bone activity except tamoxifen. The study protocol was approved by the Ethics Committee of the Mar health facilities (2013/5283/I), and written informed consent was obtained from all participants after having read the information sheet of the study and responded to all the questions. B-ABLE is a prospective, non-selected clinical cohort study carried out in the Breast Cancer Unit and the Hospital del Mar (Barcelona, Spain) bone metabolism unit. The participants were treated with AI (letrozole, exemestane or anastrozole) in accordance with American Society of Clinical Oncology recommendations11: 5 years of AI beginning within 6 weeks after surgery or 1 month after the last cycle of chemotherapy or alternatively, switching to an AI after taking tamoxifen for 2 to 3 years, to complete 5 years of hormone therapy. All participants were supplemented with calcium tablets and 25(OH) vitamin D3 (1,000 mg and 800 IU per day, respectively), and those with vitamin D deficiency (<30 ng/ml) received an additional dose of 16,000 IU. calcifediol (HIDRO-FEROL® FAES FARMA) every 2 weeks. TBS measurements in the spine were carried out using the program installed in the densitometer (TBS iNsight® v2.1, Med-Imaps, Pessac, France). The TBS is calculated on the basis of the raw data acquired by DXA, evaluating the same regions used for the study of the BMD of the lumbar spine and without additional administration of ionizing radiation to the patient. The TBS data were obtained at the beginning and at the end of the AI treatment. Information was recorded on clinical variables at the time of inclusion, including the age of recruitment, the age of menarche and menopause, the number of children, breastfeeding, previous chemotherapy and radiotherapy, adjuvant treatments, weight, height and plasma levels of 25(OH) vitamin D.
For the study of genetic association, genes were selected that code for the key factors in the synthesis and response of estrogen and vitamin D (Figure 1). 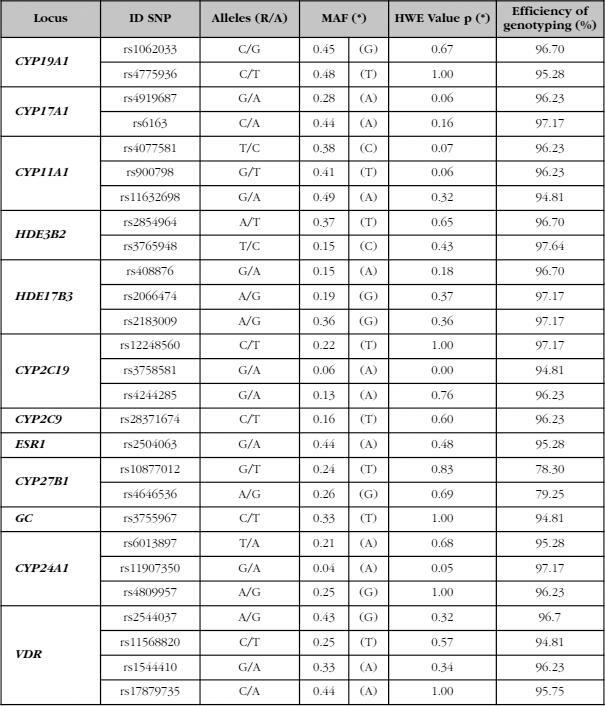 Eight candidate genes were selected in the case of estrogen: CYP11A1, CYP17A1, HDE3B2, HDE17B3, CYP19A1, CYP2C19, CYP2C9 and ESR1 and four genes of vitamin D: GC, CYP27B1, VDR and CYP24A1. The SNPs were selected on the basis of the following criteria: 1) frequency of the minority allele (MAF) >0.05; 2) tag-SNPs according to the HapMap project in the population of CEU (Residents of Utah with European ancestry of the North and the West, coming from the CEPH collection); 3) putative functional polymorphisms; and 4) previous association with other musculoskeletal phenotypes: plasma concentrations of 25(OH) vitamin D12, BMD13-16 and AI-related arthralgia17. The extraction of DNA from peripheral blood was carried out at the LGC genomic facilities. The genotyping of the polymorphisms was carried out using the KASPar v4.0 genotyping systems in the LGC genomic facilities. To guarantee the quality of the genotyping, a random sample (5% of the total number of samples) was also genotyped on a separate control plate. There was a 100% agreement between these results. Relative TBS change was calculated as the percentage change of the TBS value at the end of treatment compared to the baseline TBS value. Changes of intra-individual TBS were evaluated using the Student t test for paired samples. To assess the association between the SNPs studied and the change in TBS, linear multivariable regressions were used (log-additive, dominant and recessive models). The models were adjusted for age, body mass index (BMI) and previous treatment with tamoxifen. The collinearity, the interaction and the linear trend of the covariates were checked. The possible confounding factor for baseline and final concentrations of 25(OH) vitamin D was also evaluated. To minimize error due to multiple tests, the False Discovery Rate (FDR)18 correction was used, accepting all predictions with p<0.05 as significant. All the analyzes were two-tailed. Statistical analyzes were performed using R for Windows version 3.3.3 (packages: foreign, car, compareGroups, SNPassoc, and multi-test). The study included 212 women in the B-ABLE cohort with TBS values and who had not been treated with bisphosphonates. Half of the patients had received previous treatment with tamoxifen. The initial clinical characteristics of the study participants are shown in table 1. BMI: body mass index; DE: standard deviation; TAM: tamoxifen; TBS: Trabecular Bone Score. The percentage of cumulative intra-individual change of TBS was -0.04% [95% CI: -0.05 to -0.03; p<0.001] at the end of the AI treatment. Table 2 shows the minor allele frequency (MAF) and the p-value of the Hardy-Weinberg equilibrium (HWE) for each SNP genotyped in the B-ABLE cohort. The SNP rs6013897 showed a nominally significant association with TBS reduction attributed to AI (Table 3). The AA genotype of this SNP is associated with greater loss of TBS (mean: -5.32, SD: ±6.15) with respect to the TT genotype (mean: -2.20, SD: ±6.27). These results do not vary after adjusting for both baseline and final vitamin D levels. R: reference allele; A: alternative allele; MAF: frequency of the minority allele; HWE: balance of HardyWeinberg, *(in the B-ABLE cohort). a: adjusted for age, body mass index and previous treatment with tamoxifen; n: number of patients; ref: reference value. The results of this study in which genetic variants were genotyped in genes involved in the estrogen and vitamin D hormone response pathways show that a downstream SNP of the CYP24A1 gene is significantly associated with the change of TBS at the end of treatment with AI. This same SNP has recently been associated with total hip BMD where the A allele was associated with lower levels of BMD19. The CYP24A1 gene encodes the mitochondrial protein that initiates the degradation of 1,25-dihydroxyvitamin D3, the physiologically active form of vitamin D3. It catalyzes the NADPH-dependent 24-hydroxylation of calcidiol (25-hydroxyvitamin D3) and calcitriol (1-alpha, 25-dihydroxyvitamin D3). The enzyme can perform up to 6 rounds of hydroxylation of calcitriol leading to calcitroic acid. It also shows 23-hydroxylation activity which produces 1-alpha, 25-dihydroxyvitamin D3-26.23-lactone as the final product. In the regulation of vitamin D3 level, this enzyme plays a role in calcium homeostasis and in the endocrine system of vitamin D. This enzyme is expressed in several tissues mainly in the adrenal cortex and bladder according to the GTEX portal. The SNP rs6013897 is associated with the serum levels of 25(OH) vitamin D12, so a possible mechanism for the effect of rs6013897 on TBS could be through the changes of 25(OH) vitamin D serum; therefore, 25(OH) vitamin D levels were subsequently included as covariates in the linear regression. After adjusting for vitamin D the association of the SNP did not vary, which shows that the effect of the SNP on the change of TBS is independent of serum levels of vitamin D. This may imply that the action of CYP24A1 may be more locally of the bone tissue. This is the first study to find an association between CYP24A1 and TBS reduction due to AI treatment, which highlights the important role played by vitamin D in the prevention of bone deterioration. Interestingly, in the case of AIBL, a significant association was found with the CYP11A110 gene, whereas in the case of the loss of TBS, the associated gene is CYP24A1. These data suggest that both the loss of bone mass and the loss of TBS related to AI are genetically determined, although the genes involved in the two bone phenotypes are different. In any case, these two genes belong to the same metabolic pathway, which highlights the importance of vitamin D in the modulation of the adverse effects of IA in bone tissue. This gives more weight to the fact of supplementing patients with vitamin D, as is taking place in the B-ABLE cohort. Our study included a limited number of patients in this specific analysis of our cohort, which did not allow the detection of subtle allelic effects. However, as far as we know, this is the largest cohort available to date for genetic studies of TBS in women treated with AI. In addition, being a population study with data obtained from the usual clinical practice reinforces the observed results. Finally, the fact of working with candidate genes that have previously been associated with bone phenotypes or hormonal levels facilitates the finding of reliable associations and reduces the number of SNPs in the study. In conclusion, an association was found between the SNP rs6013897 near the CYP24A1 gene, previously associated with serum 25(OH) vitamin D levels, and the bone microarchitecture deterioration related to AI treatment, measured through TBS. Funding: This work has been financed by the Center for Biomedical Research in Fragility and Healthy Aging Network (CIBERFES, CB16/10/00245), and the grants of PI13/00444 and PI16/00818 (Health Institute Carlos III, Ministry of Science and Innovation). The Generalitat of Catalonia (DIUE 2014 SGR 775) and the FEDER funds have also contributed to its financing.